Delivers up to 2X more runtime, 20% more power and 2X more recharges than standard Li-Ion batteries. The M18 REDLITHIUM CP2.0 Battery Pack features superior pack construction, electronics and performance to deliver more work per charge and more work over pack life than any battery on the market. It offers 2.0 Ah of runtime. With Milwaukee durability built into each pack, this battery runs cooler and performs in climates below 0- degree F/-18- degrees C. Its compact, lightweight design fits in tight work spaces and reduces user fatigue. 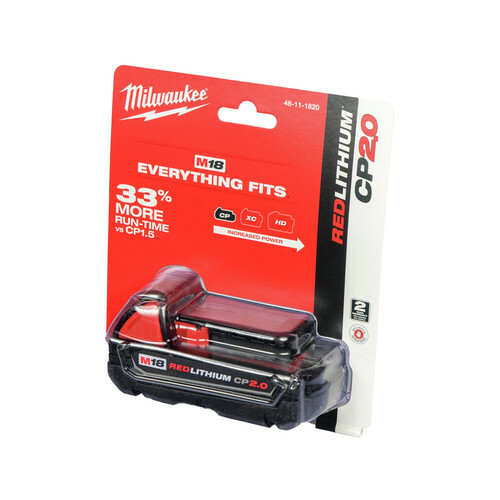 Managed by Milwaukee’s exclusive REDLINK Intelligence, the battery features overload protection to prevent you from damaging your cordless power tools in heavy-duty situations, while the discharge protection prevents cell damage. The temperature management system and individual cell monitoring help maximize battery life. Switch to the M18 REDLITHIUM CP1.5 Battery Pack to instantly upgrade the runtime and durability of your Milwaukee M18 cordless tools. I ordered this battery from this company and I’m very glad I did, I got it quickly and it’s a factory exact replacement, well worth the money because of its quality and value! I would definitely buy from them again! It's good for impact and drill use if you dont mind more occasional charging. I bought a few 5mah batteries that hold a longer charge and can be used with their saws. Okay for light use. Always nice to receive a free item when ordering a tool, especially when it's a spare battery for that tool! It obviously doesn't last as long as the full size m18 battery. But it provides plenty of power for most projects and is perfect for the times when the bigger battery is just too bulky to be practical. Very glad I have the option to use either. Works great. Lasts longer than I expected. This battery is great. It's not heavy at all and fits in the case well with the impact, charger and 2 other full size batteries. Auto tech in dodge dealer. Use everyday. had to put something in this box! LOL! It depends on the heat setting used on the jacket. On the lowest setting the battery will last up to 6 hours per charge. BEST ANSWER: Yes, it will work with the Milwaukee 2630-20 M18 18V Cordless Lithium-Ion 6-1/2 in. Circular Saw (Bare Tool). Yes, it will work with the Milwaukee 2630-20 M18 18V Cordless Lithium-Ion 6-1/2 in. Circular Saw (Bare Tool). Is this one or two batteries? BEST ANSWER: The 48-11-1820 is one (1) battery only. Will this battery work with the small Milwaukee radio? I have a milwaukee 18v lithium drill and I'm searching for two extra batteries. The batteries I have are c18b / 1.5Ah. Is the M18 18V lithium 2.0 the same battery? BEST ANSWER: The Milwaukee model 48-11-1820 batteries are compatible with your drill, and have a longer run-time than your current batteries. will the 48-11-1820 battery work in my tools that have a 48-11-2230 battery now ? also is there any way of testing a battery charger to see if it is working ? BEST ANSWER: No,they are not compatible. I have a milwaukee cordless sawmill can I replace the nicad battery with a lithium battery? will I need a new charger too? BEST ANSWER: The Milwaukee NI-Cd and Lithium Ion batteries are not compatible.